KIEV, Ukraine -- Ukraine’s ex-President Viktor Yushchenko has every chance of becoming a prime suspect in the ongoing criminal probe into illegal arms sales to Georgia. At least that’s the opinion of Valery Konovalyuk, who heads a parliamentary investigation commission looking into the matter. As to the Prosecutor General’s Office, it denies having any new such cases on its radar. In 2005 Georgia received six Buk-M1 missile complexes, which the Russian military insists were used to shoot down all the four Russian jets lost during the August 2008 war in South Ossetia. Basing on the information obtained by his commission, Valery Konovalyuk insists that the sale was illegal, that the Buk missiles were taken off combat duty in Ukraine thus baring the country’s airspace. 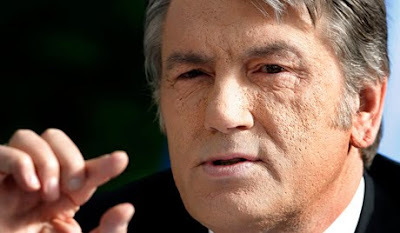 If this allegation proves to be true, Yushchenko will be in serious trouble. According to members of the parliamentary commission probing the whole matter, by authorizing the sale of the advanced weapons to Georgia at a fraction of their real cost to boot, ($200 million instead of $2 billion they were really worth) the President did a great deal of harm to national defense. Many MPs suspect that someone had his palms very well greased in that shady transaction that was personally overseen by the then President. The commission submitted its report back in 2009 but with the new leadership now in place the MPs hope that the whole thing can finally get some traction. In Kiev political analyst Vadim Karasev says that there’s been a whole bunch of statements by Viktor Yushchenko and his defense minister Yuri Yekhanurov that Ukrainian arms sales to Georgia, effected until August 2008, were fully in line with the laws of the land and pertinent international agreements. In any case, chances of Tyshchenko’s case ever reaching the court floor are next to nil, believes another Ukrainian political analyst Vitaly Kulik. Facts obtained clearly point to the Ukrainian law having been bent, namely where it comes to the Buk missiles that were taken off combat duty and sold to the Georgians. However, it looks like the only one who is going to suffer is an obscure official who, responding to a verbal order from his superiors, authorized the delivery of the Buk missiles and other weapons to Georgia. On the other hand, we are talking about the moral and political responsibility of the country’s previous leaders for arming Georgia ahead of the conflict in South Ossetia… Unfortunately, this does not entail any criminal prosecution for either Viktor Yushchenko or any other top official of his government. The shady arms deals made as part of the Yushchenko-Saakashvili brotherhood cost the Ukrainian state both money and prestige. That’s the opinion of the parliamentary commission and something the ex-president should be held personally accountable for.